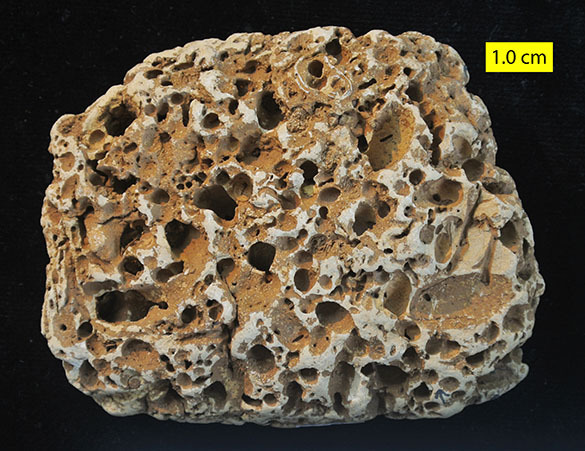 Last week I described a cyclostome bryozoan on the outside of a quartz cobble from the Faringdon Sponge Gravels (Lower Cretaceous, Upper Aptian) of south-central England near the town of Faringdon. This week I’m featuring a variety of heavily-bored calcareous cobbles from the same unit. One is shown above in its matrix of coarse gravel. 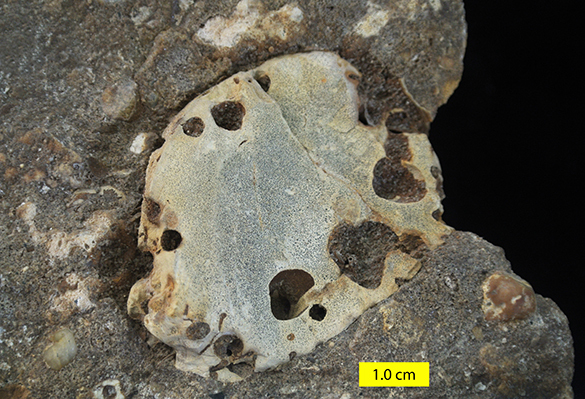 The holes are bivalve borings known as Gastrochaenolites. As a reminder, these gravels are very fossiliferous and were deposited in deep channels under considerable tidal current influence (see Wells et al., 2010). The large and medium-sized flask-shaped borings are all Gastrochaenolites. 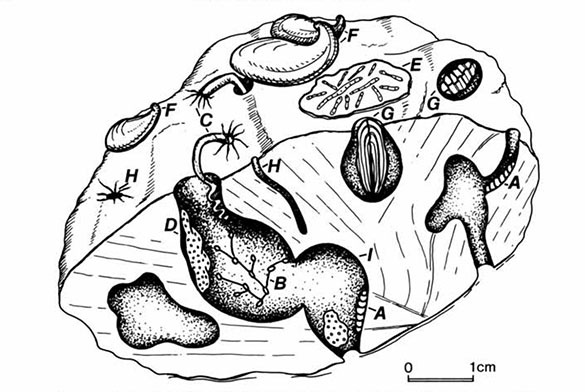 In the suite of cobbles described in Wilson (1986), there are three ichnospecies of bivalve borings: G. lapidicus, G. cluniformis and G. turbinatus. 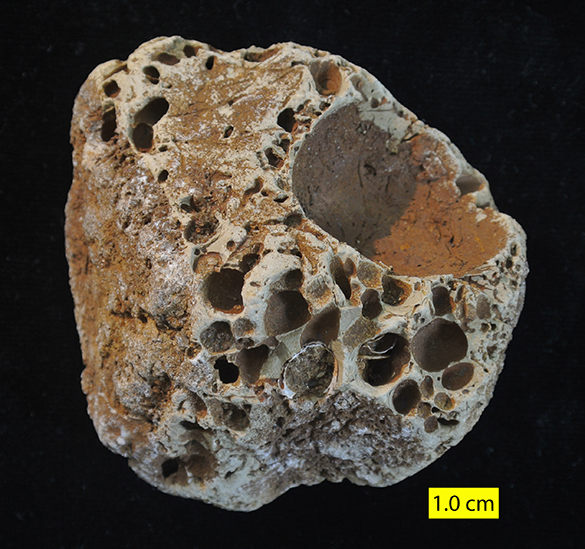 It is thus likely, although not necessarily, an indication that at least three bivalve species were boring the soft calcareous claystone to make secure homes for their filter-feeding. The thin, worm-like borings are Maeandropolydora, which were probably made by polychaete “worms”. 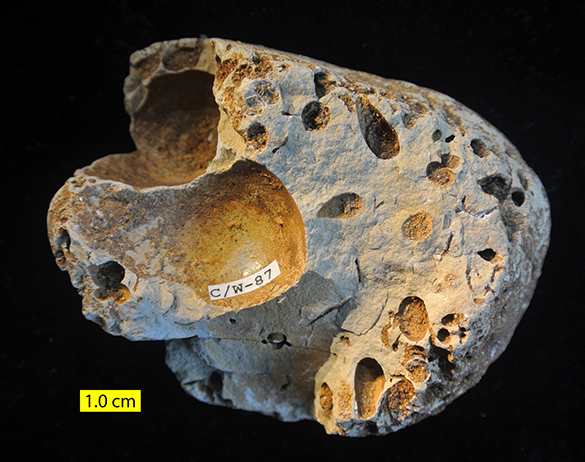 Some of the Gastrochaenolites lapidicus borings have remarkably spherical chambers, a testament to the uniform lithological character of the rock. Occasionally bivalve shells are found still preserved in their crypts, along with nestling brachiopods. Some shell bits are visible in the borings above. Some of the cobbles are so heavily bored that they fall apart quickly on removal from the matrix. On the Cretaceous seafloor this intensity of boring must have reduced many cobbles to bits before burial — a classic example of bioerosion. 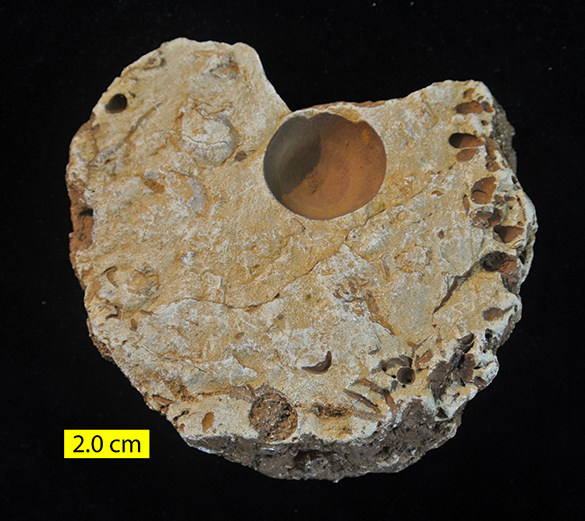 What is very cool about these Faringdon cobbles is that the borings often overlapped inside, creating a network of tunnels and small cavities that hosted dozens of bryozoan, foraminiferan, sponge, annelid worm, and brachiopod species. This is a diagram from Wilson (1986) showing the combination of external encrusters in a high energy, abrasive world, and coelobites (cavity dwellers) in the protected enclosures. A diverse community can be found on each cobble, inside and out. In a future post I will describe some of these coelobite fossils.